Whitetail Deer are one of the most exciting species to hunt, and Texas Whitetail draw hunters from all around the world. CS Outfitters has access to multiple ranches that are well maintained, and very highly managed. We believe that trophy whitetail are not just measured in inches, but in the experience of the hunt. Our whitetail range from 130-inch management bucks up to 200+ inch trophy bucks. 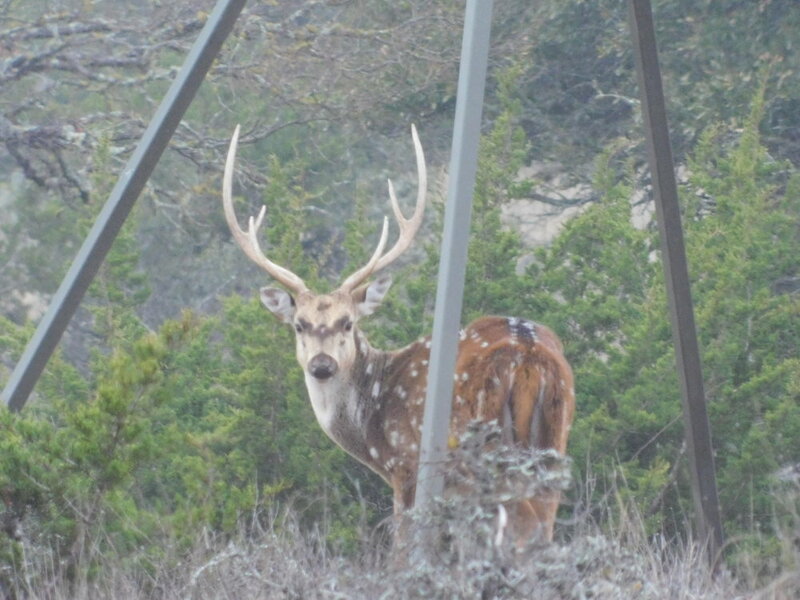 Whether you are looking for some beautiful Texas hill-country scenery, or South Texas scrub brush we can offer you the hunting experience that will keep you coming back time and again. Due to tight management restrictions, we have a very limited number of bucks that we harvest each year so our hunts sell out quickly! Be sure to contact us today to begin your ultimate hunting experience. Axis Deer are native to India. They were introduced to Texas in the early 1930s when the San Antonio Zoo purchased a herd. The YO Ranch, in Kerrville, Tx, also took delivery of a herd and over the years they have proliferated and now have free range throughout the hill country of Texas. The Axis Deer is a highly sought after query due to its towering antlers, beautiful hide and delicious meat. Axis shed their antlers at different times of the years, thus making them available to be hunted year-round. CS Outfitters has access to both male and female axis. Available hunt slots fill up fast so be sure to call us to book your exciting Axis hunt today! Blackbuck antelope are one of the smallest antelope species of the exotic breeds. Mature males differ in appearance greatly from that of females. As males age, their coloration graduates from a light tan at birth to dark brown, almost black, at 5 to 6 years of age and older. These older males exhibit a striking contrast in color with their bright white bellies, muzzle, and "eyebrows". Male horns "corkscrew" upward in a V-shape with 1-4 tight spirals (depending on age and genetic potential). Gemsbok are light brownish-grey to tan in color, with lighter patches to the bottom rear of the rump. 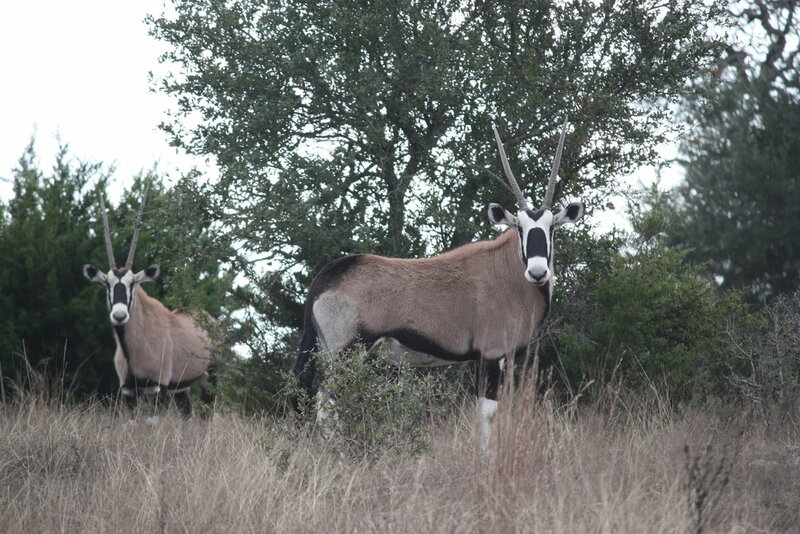 They have striking black and white facial markings that are unique to gemsbok and form a white "butterfly" pattern when viewed head on. Their tails are long, and black in color. Both genders have long, straight, ringed horns. Horns differ on males and females, males having straight horns while female horns are thinner and more curved in nature. Their horns extend from the base of the skull to a slight outward and rearward angle. The only outward difference between males and females is their horns; hunters commonly mistake females for males. Gemsbok are one of the few antelope species where female trophies are sometimes more desirable than males. Scimitar-horned oryx are a white colored oryx with a light orange to reddish neck and chest. Face and leg markings are often beige. Medium-sized antelope that is often noted for its long, thin, ringed horns that sweep back over their backs. Both sexes display horns.